A homophobic man who last week was banned for going near his MP as a previous conviction for badger offences. Paul Lewis Rees, 38, of Llwynypia, Rhondda, admitted harassing Chris Bryant MP between 2001 and 2004. A two-year restraining order imposed on Rees also banned him from making attacks on Mr Bryant’s sexuality and from threatening or doing anything in terms of harassing him. 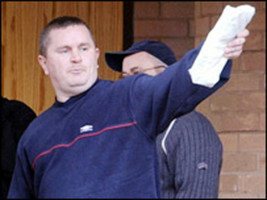 Rees, who is unemployed, was also sentenced to a 220-hour community punishment order, to be completed within a year. Nick Lloyd, Rees’ solicitor, said Rees also believed there was a “lack of moral leadership” in the area, “highlighted by the activities of the local MP.” Mr Lloyd said Rees “may despise homosexuals” but his “prime motivation is not homophobia”. After the case it transpired that Rees is keen hunt supporters with a previous conviction. In 1986, Paul Lewis Rees along with Nigel Griffiths, Michael Lane, Gerald Durham and Carl Casey were found guilty of trying to take a badger. Rees was fined £200 and £60 costs and a further £100 costs at the appeal.